Smooth cycling, always goes "bang!" Sellier & Bellot has been producing high-quality cartridge ammunition since 1825. Used by hunters, competitive shooters, law enforcement and militaries around the world, their ammunition is held to exacting tolerances in diameter and weight. With worldwide acclaimed accuracy, Sellier & Bellot has been used to win more target competitions than all other target bullets combined. Get yours at the best price, here at Sportsman's Guide! Sellier Bellot Handgun, 9mm, FMJ, 124 Grain, 50 Rounds is rated 5.0 out of 5 by 10. Rated 5 out of 5 by Sgt America from Excellent 9mm Ammo I've shot lots of this 124 grain ammo, through a variety of quality guns. Never any jam issues. Quality, Shiny, Slick and Smooth, Accurate! Loaded to FULL European Spec!, Hot!, unlike current American mfg. that load it down, and cost twice as much, and their ammo appears to be stored on pallets in the rain and snow uncovered, for a couple of years or so, before I get it. I like S+B smallish quality packaging also. Rated 5 out of 5 by Daniel from Good price for excellent 9MM Very good ammo works just great in my 9's. . Rated 5 out of 5 by WBun from great great match for CZs. 100% performance no FTF FTE. 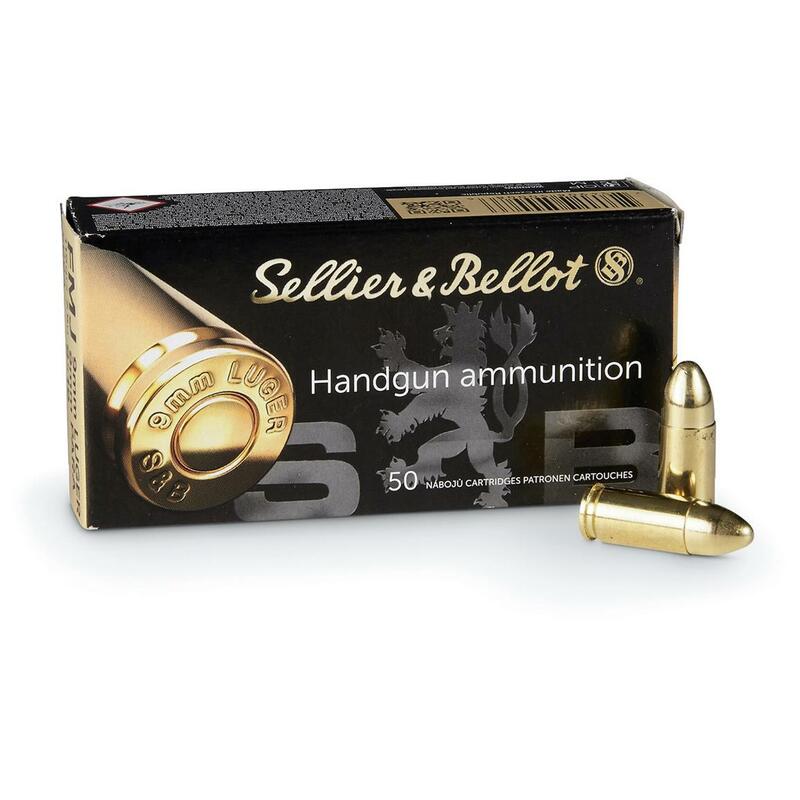 Rated 5 out of 5 by arp1 from Sellier and Bellot 9mm have not had a chance to shoot these yet. But have shot this brand with no issues in the past. And as usual price at under $10 was great and fast and reliable shipping always from the Guide. Rated 5 out of 5 by peter1974 from Reasonable price for excellent practice ammo Reasonable price -even better when on sale. Free shipping is a bonus. Excellent range ammo. My Sigs are happy. Rated 5 out of 5 by onthelake914 from Quality Clean Ammo I have used S&B 45acp and decided to try 9mm, very satisfied with both. This is a good quality low cost range ammo. Rated 5 out of 5 by Michael from Bang Good round, use this round for everything, I feel safe with a full clip in my go to guns. Works every time and accurate. Cost effective. Rated 5 out of 5 by Sloopjonb from Got this item for a great price. Got me a 9mm rifle and never shot it before so I ordered a box of this to shoot. My son in law and I put about 50 rounds into the gun new gun new ammo flawless results. New FlexLock bullet eliminates clogging and aids expansion. Supremely accurate, dependable knockdown power. Jesse James, Black Label, 9mm Luger, Hollow Point, 124 Grain, 20 Rounds. Jesse James, Black Label, 9mm, Hollow Point, 124 Grain, 20 Rounds.